Window shades have become a product where parents are advised to use extra caution. Although they are accessories meant to add appeal to certain rooms while keeping glare at bay, they often come with unintended side effects. Children, especially those who are still in infancy, often see the strings and cords associated with shades or blinds as play items. When babies and small children are placed near windows that aren't properly secured, you may be placing them into the arms of danger without even realizing it. Lock the Cord to keep it out of reach of children. When you're working with traditional window coverings, you'll need to be aware of the places where you place your cords. Tasseled and adorned cords can present an obvious place where children will want to play. Explore Innovative Options. At Polar Shades Sun Control, we created our Safety Tension Device with the purpose of keeping small children safe at the forefront of the design process. Traditional cords are able to be pulled and played with regardless of their placement. With the installation of our Safety Tension Device, the shade is inoperable if the safety tension device is not securely mounted to the wall, although the cord still presents a danger. It is imperative to properly install the device to the wall. With this innovative device, accidental mishaps and curious fingers are significantly less capable of causing problems relative to window covering cords. When installed properly, only intentional use of the cords and strings will be possible, as the Safety Tension Device disallows the chain connector and/or stop bead to pass through the opening until the device is properly locked in place onto its mounting surface. Be Mindful of Placement when you're arranging rooms. If you have cribs or beds for little ones in an area that also contains windows, move the beds, furniture, and toys away from the window areas. Even innocent, everyday actions can result in unintended consequences if you're not careful with the placement of your furniture. Retro-Fit Older Windows to reflect today's standards. 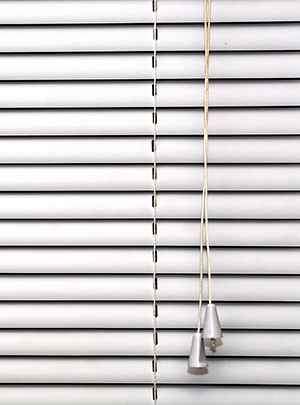 If you own an older home, retro-fit your window blinds, shades, and drapes to meet today's standards. Anything manufactured before 2001 may be built with hazardous cord implementations. Implement cord-repair devices, or simply replace your window coverings, to come into compliance with 2016's standards. Go with a Pro. Choosing window coverings that keep your children safe isn't always as easy as it appears. If you're not sure how to navigate the safety options, call upon the help of an experienced and licensed professional to help complete your project. If you are ready to learn more about the benefits that come with great window coverings, including built-in shade safety, request a free quote from us today!